Remembrance Day services have been taking place across the North East and Cumbria for those who died fighting for their country. Ex-servicemen and women were joined by church and civic leaders to pay tribute at ceremonies and parades in Newcastle, Gateshead, Durham and Carlisle. 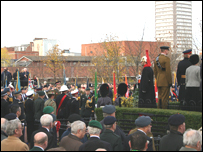 Sunderland hosted the largest service and parade outside London, according to the city council. Services were also held in Darlington Middlesbrough, Hartlepool and Penrith. More than 700 serving and ex-servicemen and women, including the Coldstream Guards, the Household Cavalry and the Light Infantry, the Light Dragoons and the Parachute Regiment attended Sunderland's Sunday Parade and Service at the war memorial in Burdon Road. The parade was led by the Band and Bugles of the Light Division, one of the biggest and most distinctive bands of the British Army. Representatives from the High Commissions of the United States of America, France, Bangladesh, Canada and Australia also attended.